I’ve gone through a pretty infuriating mass of technical issues lately, TAY. The internet at my university isn’t capable of handling the amount of students who attend, so it has a tendency to just… not work for anyone. There are a few workarounds for it, but it tends to be more trouble than it’s worth, and by the time you’ve managed to get it to work properly, it’s probably too late to be able to do too much work anyways. So lately, I’ve settled for doing homework at home. I actually designated a few days—notably before the release of The Phantom Pain—to set aside for my online course this semester. When those days came, however, I was left with no internet. Somehow, someway, AT&T disconnected my line. I don’t know where, and I don’t know why, but they totally did it. So I was left to tether from my phone for three-ish days. It finally came back yesterday afternoon with a bit of good news. The arbitrary limitation on my 3Mbps internet cap for my home was lifted when the technician saw that I was getting speeds of around 10Mbps through my line. As a result, I should (allegedly) have a 6Mbps (allegedly) connection by Thursday (allegedly). I don’t believe it, but that’s what they said. It’s not like they’d have a monetary incentive to lie about it or anything. Regardless, it’s worth a shot, so maybe I can get more into this “streaming” thing that all the kids do. I’m going to be busy trying to catch up on coursework now that no-internet and The Phantom Pain have taken their toll, so I won’t be able to host much. 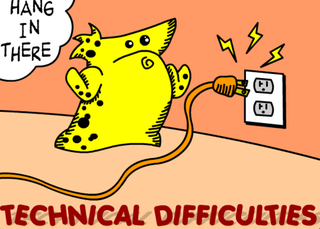 That being said, feel free to share your latest technical horror stories. Not interested in tonight’s topic? Rather talk about The Phantom Pain? Then feel free to do that, or talk about life, love, other gaming related things, or whatever else you desire. The Graveyard Shift is now open.